For any company to be successful, team building is a must. That’s the reason companies organize team lunch, dinner parties, cricket match, holidays etc. to bring the team closer. We have already shared Sample invitation letter for Annual staff party, Annual dinner invitation email to staff etc. to help you invite your staff for company get-togethers. Now, we have a team invitation email sample designed for you. Using this official meeting invitation email, you can formally invite all the team members to attend the event. This is to inform you that the Marketing Department is organizing a Team Building Meeting for all our staff members on 2nd July, 2018 at Meeting Audi- I from 11 a.m. till 7 p.m. In order to grow in our career, it is extremely important that we grow together and that can only happen if we work as a team so that our skills and talents synergize to bring better results. That’s the reason our department keeps organizing various team building activities from time to time. At this event, we have organized a meeting in which all team members will be asked to share their experiences as the team member. They can also come up with suggestions or share reasons which restrict them from delivering the performance they expect to. There will also be a few team building indoor games along with a lunch sponsored by the Company. We look forward to your presence at this team building event which is been organized for helping each one of us grow. In case you think you will not be able to attend this meeting, kindly inform the same to Ms. Geeta Gupta at 98989-12345. 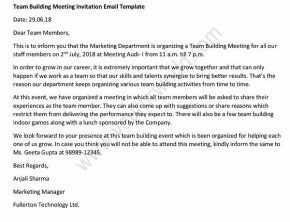 Download quick and easy Team Building Meeting Invitation Email template in Word format. You can have it customized to suit your subjective requirement.